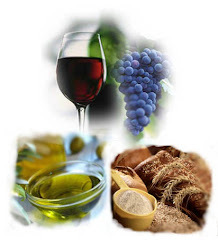 We have learned more about Anointing Oil, and the power and the true meaning of Holy Communion from the past few posts. Now I want to talk about the effects and application of both the Oil (Anointing Oil) and the Wine (Blood of Jesus; His sacrifice at the cross). As requested, I’m going to talk more about Jesus’ sacrifice (His Flesh and Blood) and also about the Power he gave to us. For you information, a denarius is a man’s pay for one whole day. A quart of wheat is a man’s one time meal. Barley has a much lower quality than wheat. So, this verse means that a man’s one time meal is worth that man’s pay for one day. Basically speaking, the man can only eat once a day. This represents the nowadays condition, where crisis and economic recession is everywhere! These verses are truly beautiful. God gives us the solution in which we can survive the tests he has prepared for this world. By receiving His Flesh and Blood, we live in Jesus and Jesus lives in us; His Word lives in us. And He said ask whatever you desire, and it shall be done for you! Then with Anointing Oil, we are honoring God, we are pleasing God, and God will be glorified; since Anointing Oil also honoring men, men are honored to be the salt and light of the world. So that the whole world may see Christ in us, see the prove from God, and repent. Christ lives in us, and we live in Him. We are His ambassadors on this earth, and God, with His Anointment of Holy Spirit, will give the world prove of His chosen people; that is, for those who receive His Oil (Anointment of Power and Holy Spirit) and Wine (Blood of Jesus, His sacrifice at the cross). And to give all the world prove about God’s chosen people and that Jesus is the God Almighty, we won’t be harmed by all those sicknesses, illnesses, recession, and also the devil. This is the Truth from the Bible!